11. Multipet Duckworth Duck Large 13"
Every dog and dog owner needs an arsenal of toys to help navigate living in a human household together. While we may take it for granted that dogs should understand not to chew on our possessions and treat our homes with disrespect, it does not come naturally to a dog to not jump on or chew on the couch or treat every object that she finds like a toy. In fact, it is very important for us to teach our dogs what is theirs and what is ours. In order to do that, it is essential that we give our dogs possessions of their own. The best dog toys provide mental and physical engagement in a way that is fun and safe for your dog. There are a lot of dog toys on the market, overwhelming you with possibilities. Here are the top 12 best dog toys for a variety of dogs and needs to help you narrow down your search for the perfect dog toys for your dog. There is nothing like playing outside with your dog on a beautiful day. A game of fetch or frisbee with your dog can make your problems seem to melt away. The best outdoor dog toys are durable, visible, and weatherproof. While a good tennis ball will always be the go-to fetch toy for many people and dogs, there are many more options to consider that offer more than the typical tennis ball or stick. If your dog loves to play fetch with a standard tennis ball, she will love this Chuckit! Ultra Ball. This ball is compatible with the Chuckit! ball launcher which allows you to throw the ball much further than ever before with minimal effort. If your arm is tired long before your dog is, you will love the capacity to increase the effect for your effort so dramatically. You can choose the exact size for your dog from small to extra extra large. These balls are natural as well as durable. An extra thick rubber core is tough enough to last for the long term even if your dog does some chewing as well as fetching with this ball. You can feel comfortable about your dog using this ball since it is made of all natural rubber. The rubber construction is high bounce as well. The ball will move in an exciting way, causing your dog to jump and leap. This construction also means that the ball will float in water, making it one of the best outdoor dog toys for water games or pool play as well. It is very easy to clean this completely rubber ball, unlike the fabric covered tennis ball. Even if your dog is a very slobbery player, you will easily be able to wash off the ball with a little bit of water so it looks as good as new. 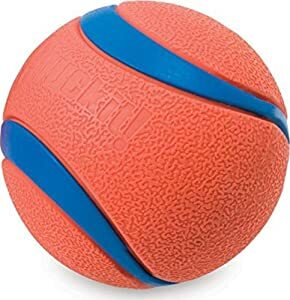 You can clearly see the bright orange and blue of this ball when you are playing outside. This makes it easier for your dog to catch the ball and easier for you to find it if she loses track of it as well. It is very frustrating to lose the toys that you have paid good money for, so the capacity to easily track down the ball will save you money in the long run. If your dog loves fetch a little more than you do, these Chuckit! balls may be a game-changer for you and your dog. These balls work better than the old fashioned tennis balls in many ways, including having better durability and bounce and not getting as dirty or slobbery. Because they also work with the launcher, you can get a lot more distance when throwing these balls than you can with a standard tennis ball. Furthermore, you can choose precisely the right size for your dog’s mouth. Here is a toy that provides not only fun, entertainment, and mental stimulation for your dog, but also offers the opportunity for behavioral correction. If you are only going to buy one outdoor play toy for your high energy or powerful dog, this might be the one for you. Dogs that are displaying behavioral problems are often in need of more instinctual outlets and physical activity. The Puller allows dogs to engage with tug and fetch as well as chasing and catching the toy. This clever toy can be thrown as a traditional fetch toy, rolled along the ground to stimulate a chase response, or used as an intense tug toy. This is the best outdoor dog toy for dogs with behavioral concerns including aggression, disobedience, or destruction. The lightweight construction of the Puller lets anyone work with it for long periods without fatigue. The material is also buoyant so that it is a great toy for pool or beach games. Because this toy is designed for pulling and tugging games the material is structured so as to not damage your dog’s teeth or gums, even if she pulls very hard or hangs from the toy. The unique material allows your dog to sink her teeth into the toy without damaging it so that neither your dog’s teeth nor the toy will suffer from the play. This non-toxic material won’t leave any strange smells on your hands or smell strange to your dog. Keep in mind that the Puller is designed for active play and training and should not be left for your dog to play with as a chew toy or unobserved. The company advises that you keep interest in the toy by not allowing your dog to play with it for too long and always stopping the game when it is in full swing. If you are looking for a multifunctional play aid and training tool for your powerful and energetic dog, this might be the best outdoor dog toy for you. This ring offers you several options when playing fetch and also provides one of the safest tug experiences. 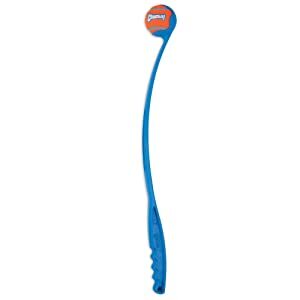 Remember that this isn’t a chew toy, so if you are looking for a fetch toy that can also entertain your dog when chewing, this might not be the best choice for you. Balls are great for fetch but let’s face it, it takes a lot of effort and repetition to throw the ball enough times to wear your dog out. Even if you are using a ball launching device, you will still often find yourself tired before your dog when playing Fetch with a ball. A disk can fly longer with less effort than a ball and also allows your dog to get under it as it descends for fantastic catches. You and your dog can have a more exciting game of fetch using a high-quality disc. The Chuckit! Paraflight Dog Toy is the best outdoor dog toy for dogs who love to fetch. The desk has an aerodynamic shape that is perfectly designed for long-distance flight. If you have the wind with your throw, you will be amazed by how far the disc will go, but due to the compact shape you can even throw it upwind or with no wind surprisingly well. Unlike most traditional frisbees, this disc floats in water. The lightweight, buoyant material makes it the perfect fetch toy for the ocean or the pool as well as in the backyard or at the park. The flat shape of a disc is easier for many dogs to grab in the water than a round-ball which can pop out of a dog’s mouth, frustrating the fetch experience. The raised sides and smooth rubber edge make this disc easier to pick up on land or water for most dogs. The Paraflight Dog Toy is very durable so that you can enjoy playing with it for many years to come. It is made of a multi-layer nylon construction that will hold up to many tosses even if your dog tends to chop a bit as she returns. The disk has bright colors which hold up well so that you can see it clearly if your dog loses track of it. Do you enjoy outdoor night games? There is a glowing version available of this Paraflight frisbee that charges to a bright light in as little as 5 minutes and offers 20 minutes of illuminated gameplay so that you will never lose your dog’s toy again. Both versions of the Paraflight flyer come in two sizes so that you can customize it to your dog’s mouth. If you are looking for a new way to extend your fetch game, this Paraflight dog toy might be the best choice for you. This is a great toy for dogs who like to run a long way to fetch a disc from land or water. If your dog wants to chomp and play tug with the toy as well as fetch, this may not be as good of an option for you. A busy dog is a happy dog. You can’t always play with your dog, so it is important to have toys available that she can play with by herself. Find the best dog toys to keep them busy with these informative reviews. Here’s a toy that allows your dog to use her instinct to seek out little squeaky creatures in a fun and adorable way. Stuff the soft trunk with the little squeaky squirrels and let your dog have fun searching for them and pulling them out. This toy comes in four sizes so that your dog will have fun no matter her size. Keep your dog interested by playing fetch with the squirrels or using them as hide and seek toys. Your dog will love solving the problem of finding the squirrels within the trunk or wherever else you hide them in your home. Your dog’s excessive energy will be spent on solving the problem of finding the squirrels instead of getting her into trouble. Lots of interactive dog toys rely on food or treat distribution to entertain and occupy, but if your dog is overweight, as many American dogs are, the last thing you want to do is give her more kibble or treats to entertain her. A toy like this can provide your dog with lots of entertainment calorie-free. If your dog loves this toy, you’ll be happy to find that the company makes other Interactive squeaky toys and places for them to hide so that you can mix and match and keep the game interesting. You can also hide all kinds of other fun toys in the stump so that your dog will never know what she’s going to find. These are plush toys, so if your dog tends to rip and shred her toys this may not last long. If your dog does not deliberately try to destroy toys, however, they are likely to last a long time due to the durable construction. If you are looking for new entertainment for your dog without using food or treats, this may be the interactive game that you have been looking for. 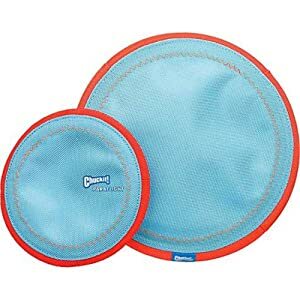 This is one of the best dog toys for entertaining your dog without food and without requiring too much engagement from you. Just stuff the trunk full of squirrels, keep an eye on your dog to make sure she doesn’t destroy anything, and let the fun go on. Treat or kibble dispensing toys are a great way to turn meal time into game time and occupy your dog’s active mind for long periods of time. Dogs that tend to eat too quickly will be slowed down by this feeding tool, preventing the dangerous condition known as bloat. This toy makes feeding time active for your dog, encouraging her to chase and roll the ball around to distribute the kibble inside. You can change the difficulty level of the toy as your dog masters the activity so that she will remain interested and challenged as her skill increases. Because this activity is self-rewarding, you won’t have to do much but fill the ball and let your dog have fun. It is a good idea to let your dog do this somewhere where kibble won’t easily fly underneath furniture and where the ball won’t get lost or stuck anywhere. Keep an eye on your dog to make sure that she won’t get the ball open or chew on and damage it. Encourage your dog to only roll and chase the toy and not chew on it, since this is not designed to be a chew toy. The non-toxic plastic construction of this ball twists apart easily so that you can clean and fill it. Choose between two sizes for the perfect size for your dog. The OurPets IQ Treat Ball is a great toy to keep the average dog busy during dinner time. The round construction makes this a fun toy since it rolls all over the place, encouraging your dog to chase and knock it around. The plastic construction is not as heavy-duty as a toy designed for chewing, so if your dog has powerful jaws and tries to chomp on this toy there’s a good chance she will break it, making this a better engagement toy for supervised playtime. has a scent and flavor that your dog won’t be able to resist. Instead of getting into trouble or irritating you, your dog will spend her down time happily chewing. This toy is flavored with your choice of food grade peanuts, bacon, or chicken. Don’t worry, your house won’t smell like bacon or peanuts, but your dog’s sensitive nose will be thoroughly stimulated by the smell of this delicious chew. You can feel good about buying this toy for your dog since it is made in the USA out of ingredients that are sourced right here in America. Benebone is committed to making high quality products in America and supporting American business. You can feel even better about buying a product from this company, since they donate an amount of every purchase to US shelters and rescues. 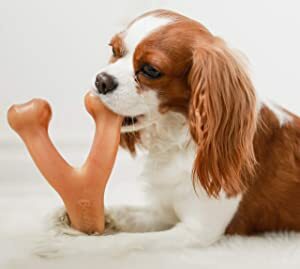 The design of this bone is modeled after a real meat bone and is also patented to be as ergonomic as possible for your dog to chew on. This design rocks easily in a position that lets your job establish a chewing motion and settle in comfortably. The nylon material will wear down as your dog chews, creating ridges and shards that clean your dog’s teeth. Choose between three sizes to get exactly the right bone for your dog. If you are between sizes, simply go up to the larger size. Don’t worry, your dog won’t mind. If you have given up on nylon bones with your dog, this Benebone might be worth a try. This bone has a taste and smell that can entice dogs who otherwise don’t care about synthetic chews. The innovative shape makes it easy for dogs to hold on to the bone and grip it. As this bone breaks down, it will clean your dog’s teeth and gums, maintaining dental health and hygiene. Are you looking for a food dispensing toy that can entertain your dog for hours and slow feeding but won’t leave treats or kibble all over your house? 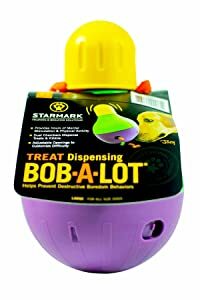 StarMark Bob a Lot can fit your dog’s entire meal and slowly distribute it as your dog plays with the toy in a generally stationary area. The openings are adjustable so that you can accommodate most kinds of food and also make distribution more or less challenging. Keep the game easy as your dog gets the hang of it, then increase the difficulty as her skill develops. This way you can maintain extended play time even as your dog masters the toy. The weighted anti-slip bottom makes the difference in this food distributing toy. This bottom prevents the toy from sliding all over, even if you have hard floors. This means that food will only be distributed in a limited area, keeping your floor cleaner and preventing kibble from ending up underneath the furniture. Furthermore, this weighted bottom provides an enticing bobbling motion that wobbles erratically and entices your dog to play with the toy. When food comes out, your dog will be even more excited to continue playing so you won’t have to do much to encourage your dog to use this toy. The hard plastic construction of this toy is quite durable, but it is not designed to be chewed on, so if your dog is a heavy chewer and is chomping on this toy it may not hold up in the long-term. This is a toy that can distribute your dog’s meal in a way that is fun and fully engaging but won’t leave your home covered in kibble and lick marks. Because this food distributing toy tends to wobble in one place instead of going all over, it contains the mess while still entertaining your dog. The durable plastic construction can hold up to a lot of wear and tear, but this toy is not designed to be a chew toy so if your dog takes to chomping on it and can be destroyed quite easily. The Kong has become a beloved classic with pet lovers everywhere. This versatile toy is one of the most durable you are likely to find. It is one of the best dog toys for dogs that can destroy practically anything, as well as for dogs who are generally unmotivated chewers. This makes the Kong unusual in being one of the few toys that is good for almost all dogs. This is a fun and durable fetch toy for use on land or in the water and many dogs enjoy chewing on it whether it is stuffed or not. The durable, non-toxic, all natural rubber construction has great bounce and the rounded shape makes the toy bounce unpredictably so dogs will love chasing it all over the place indoors or outdoors. Stuffing the Kong really opens up the opportunities for what it can do. By stuffing the Kong, you can encourage dogs to chew and lick for many hours. When dogs are chewing on the Kong, you know they aren’t getting into any trouble. This is a great toy to give dogs while they are in their crate or during down times. You can stuff the Kong with your dog’s usual kibble mixed with some cheese or peanut butter to make it stick or use only peanut butter or Kong cheese filling. You can freeze the Kong to make the fun last much longer. A frozen Kong is a perfect treat for hot summer days and is extremely soothing for puppies who are teething. 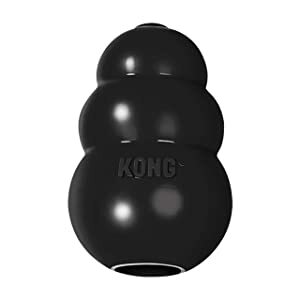 The Kong classic comes in a wide range of sizes that will fit any dog’s needs. If you are unsure, err on the side of the larger Kong, since a Kong that is too small for your dog is more likely to be destroyed. 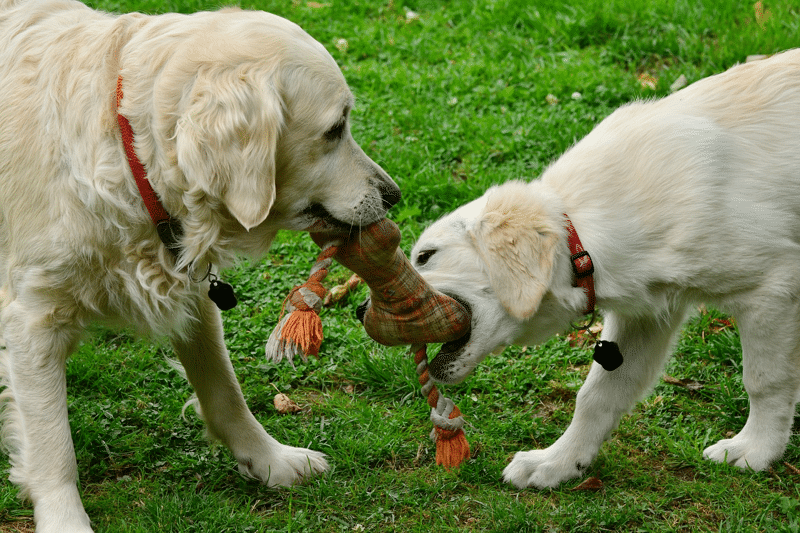 The Kong is a classic in the pet industry for a good reason. This is a durable toy that tends to stand up to heavy chewing. It works well as a unpredictable bouncy fetch toy, a rubber chew toy, and is also stuffable to provide hours of chewing and food distribution entertainment. While the most intense chewers may still be able to destroy this toy, the vast majority of dogs do not and it is a great toy for most dog owners to have in their arsenal. Being away from your pup can be stressful for both of you, but unlike you, your puppy does not know that you will be back or why she is alone. Whether you have a new puppy who is missing her littermates and mother or an older dog who suffers from separation anxiety, you may be surprised to learn that there is a toy that can help. The Snuggle Puppy Behavioral Aid Toy mimics the softness, warmth, and even the heartbeat of another dog so that your dog will feel like she has company even when she is alone. This is an incredible tool for alleviating anxiety. If you have tried Thunder jackets, soothing pheromones, or even medication without success, this toy might be worth a try. If you are bringing home a new puppy for the first time, you can expect some night time anxiety and crying as your puppy adjust to being away from her family. The Snuggle Puppy can alleviate the anxiety of that time for both of you, making your new puppy feel at home right away and keeping you from having to deal with nighttime crying. Puppies cry at night when they have to go to the bathroom, as well as out of anxiety. By alleviating your puppy’s anxiety, you can know for sure that your puppy is crying because she needs to get out of her crate and not just because she is feeling lonely. This can make potty training much quicker and easier. You can put the scent of your puppy’s mother on this toy or put your own scent on it to provide additional comfort. A disposable heat source that is non-toxic and safe for pets and people is included with this Snuggle Puppy. The heat will last for 24 hours and additional heat packs are available. The real feeling pulsing heartbeat is very easy to use. Just press the power button to turn on for 8 hours or press and hold for 5 seconds to turn on for 24-Hour continuous use. It is easy to keep this heart going with two AAA batteries that will last up to 2 weeks. Both the heart and the heat pack fit into the convenient belly pouch. You can also put a cloth or rag that holds odor in this belly pouch. don’t worry if your Snuggle Puppy gets dirty. You can easily wash it in the machine on the gentle cycle without the heartbeat or warming pad inside. Choose between 4 cute colors. Peace and quiet are worth just about any price to most people, and while there is no guarantee that this will work for your dog, it is well-designed and works for enough dogs that it might be worth a try. The warmth and heartbeat can be very soothing for puppies away from their littermates and mothers for the first time, and for older dogs suffering from separation or the loss of a loved dog. A toy doesn’t have to be complicated to be a lot of fun for your dog. This simple plush toy has squeakers to make play more engaging and exciting for your dog. The fluffy coat is extremely plush and soft and your dog will like cuddling with this toy as much as she will enjoy playing with it. The Lamb Chop character is based off of a Shari Lewis TV puppet that was a classic during the 60s. If you or your friends are a fan of the show, it will make it even more fun to see your dog enjoying the cute character. This fluffy toy is likely to become your dog’s new favorite. If your dog is the type to rip apart and disembowel her toys this little lamb chop may not last long, but it is not terribly expensive so if you don’t mind letting your dog have her fun with her own toys this maybe a good target for her fun aggression. 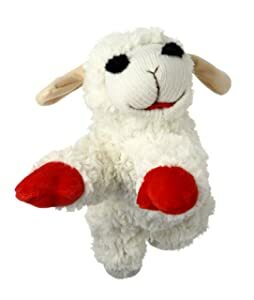 If you are looking for a cute, simple toy for your dog to snuggle, this little Lambchop might be the right one for you. 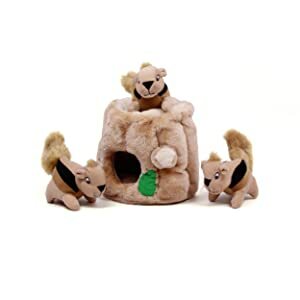 This is a cute and simple toy with a very soft exterior and squeaky toys inside for your dog’s entertainment. This is not a toy for even slight chewing, so unless you want to let your dog have fun de-stuffing it, this might not be the best choice for chewers. Here is an adorable little toy that is perfect for indoor fetch or cuddling. 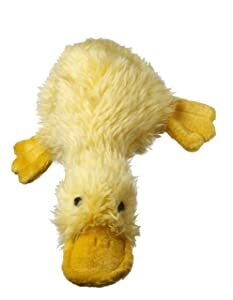 The classic yellow ducky design is plush with shorter fur on the beak and feet and longer for on the body. The shape of the duck is cute and looks like a duck but also makes throwing easy by holding the head and neck and tossing the heavier body area. This is a versatile toy that is perfect for the dog that likes to snuggle and fetch the same toy. A squeaker adds interest for dogs who like to chomp. At this very affordable price, this can be a great toy for dogs that like to shred and pull out the stuffing inside. The toy can still be fun with all of the stuffing gone, and at this price you can afford to replace it. For dogs who sometimes rip and shred their toys, just may be one of the toys they decide not to rip and shred. The design does not make it very easy to grip and the quality is good so dogs who are not very determined chewers may be dissuaded. This is a cute little duck that your dogs will very likely fall in love with. Whether you want to play a quick game of soft indoor fetch or whether your dog wants to play by herself squeaking and tossing around her stuffed toy, this can be a great source of fun and entertainment for a very reasonable price. Does your dog have a tendency to destroy everything that she gets her teeth on in the first couple minutes? Goughnuts designs safe toys for powerful chewers, and this tug toy is no exception. This is not designed to be a chew toy, so it does not have the red safety indicator of the chew toys. Rather, this toy is designed to be a highly durable and effective tug toy for you to play with your dog or for two dogs to play together under supervision. Although this is not designed to be a chew toy, the same heavy-duty rubber that is used on chew toys is used on this so you know that this is a highly durable product that can stand up to your dog chomping as hard as she can for a long time to come. You’ll be able to appreciate the durability of this toy as soon as you pick it up, due to the weight. The figure 8 design of this toy is made to protect your hands from accidental bites or scratches from your dog’s teeth and also provide a grip that keeps your dog’s mouth safe. You can play as intense a game of tug as you like, including lifting your dog off the ground if that’s how she likes to play, without worrying about injuring her teeth like you could with a rope tug toy. 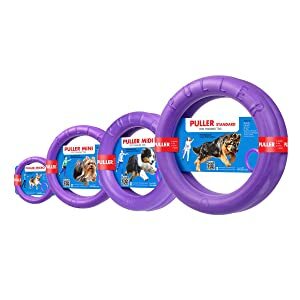 This is an awesome toy for dogs to play tug-of-war with one another, especially since each dog can have its own ring to hold on to. This makes it a good toy for larger and smaller dogs to play together, or for equally sized dogs to play. While you shouldn’t leave your dog unattended with this toy, it is tough enough to hold up to individual play as long as your dog doesn’t sit down and really start to chew on it. If your dog takes games of tug seriously and can rapidly destroy most toys, this durable tug toy from Goughnuts might be your dream come true. 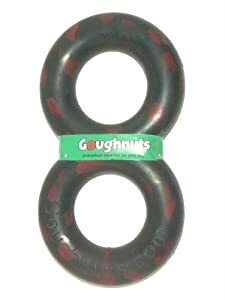 The Figure 8 design protects your fingers and also makes this a great toy for two dogs to play tug together. The rubber is the same as the durable chew toys made by this company, so although there is no red safety layer you can still feel confident that this toy can hold up to some serious abuse. We give our dogs toys for their health and entertainment, but unfortunately, it is not uncommon for dogs to hurt themselves with toys. Injury resulting from toys is one of the most frequent causes for the most serious veterinary visits. Dogs that swallow pieces of toys or entire toys are at serious risk of having the toy lodge in the throat, stomach, or intestines. Often, this situation can only be resolved with surgery. Even with the best efforts of veterinary surgeons, many dogs do not survive ingesting toys. Rope toys and stuffed toys are especially common culprits of these kinds of problems, but all kinds of toys can be eaten inappropriately. To play it safe, always watch your dog with a new toy, even if the toy is considered “indestructible”. Choose toys that are rated for your dog’s size and chew intensity. Never let your dog chew on toys that are designed only for fetch, and don’t leave your dog alone with a toy until you have observed her playing with it safely for many hours. If your dog is growing, remember that she may quickly outgrow her toys. A toy that withstood her chewing a week ago may suddenly succumb to strengthening jaws. Check all of your dog’s toys frequently to make sure they are not wearing down. The best dog toys hold up to many hours of play without breaking down, and the best chew toys wear down safely, but always actively observe the state of your dog’s toys, even if they are new. Only choose toys that are high-quality and made by respected companies. While keeping your dog in good toys can get expensive, it will still be cheaper and much better than a vet visit. Each dog is an individual and a great toy for one dog will not be good for another. It is extremely important that you observe your dog with a new toy so that you can see the way that she will play with it and find any potential dangers. Have fun picking out toys for your dog and playing with them and remember to always switch out toys for variety and inspect toys for safety.